A comparison between organic and conventional agriculture: you’re missing the point. You are here: Home / Chemical Risk Assessment / A comparison between organic and conventional agriculture: you’re missing the point. Michael Clark and David Tilman recently compared organic and conventional agriculture (Clark & Tilman, 2017). 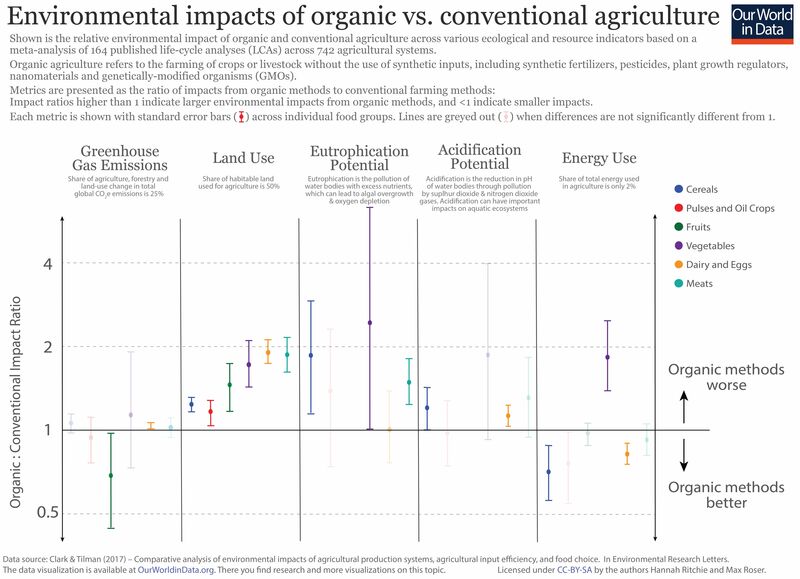 The analysis was taken up and republished by “Our World in Data” in a post titled “Is organic really better for the environment than conventional agriculture?” However, both, the paper and the blog-post, miss a major point, perhaps the major point. The analysis compares the performance of agriculture systems in five categories: greenhouse gas emissions, land use, eutrophication potential, acidification potential and energy use. However, they do not analyze environmental pollution, pesticide residues in food items, and impacts on occupational health as a consequence of pesticide use. Which, to me, makes the whole comparison basically useless. Five environmental indicators were used in this analysis: greenhouse gas emissions, land use, energy use, acidification potential, and eutrophication potential. The analyses were limited to these indicators because a very limited number of publications reported data for other indicators such as human health, ecotoxicity, or biodiversity. There is, of course, nothing that the authors of a meta-analysis of existing studies can do about such data gaps. But what the authors can do, and should have done, is to more clearly point out those data gaps and to discuss the consequences. After all, minimizing toxic impacts on humans and the environment from pesticide use is the major incentive to prefer organic over conventional agriculture. agricultural production has a multitude of environmental impacts beyond the five environmental indicators analyzed here; few LCAs analyses have examined agriculture’s other environmental impacts such as water use, pesticide use, or impact on biodiversity. Analyses into these, and other, understudied aspects of agriculture’s environmental impacts are needed to more fully elucidate agriculture’s entire environmental impact. I agree. And delete the “more fully”. from: EFSA (2017). MRL = Maximum Residue Level. Those are “the upper levels of pesticide residues that are legally permissible in or on food or animal feed, based on good agricultural practice and the lowest consumer exposure necessary to protect vulnerable consumers” (from EFSA). Basically, it is assumed that pesticides at their MRL do not lead to an exceedance of the corresponding ADI (Acceptable Daily Intake, i.e. an amount of pesticide was found that, given average consumption of the food item in question, is assumed to be without adverse health consequences even after lifelong exposure). This makes certain assumptions on average consumption pattern, for the various food items, which are modeled by EFSA using the so-called Pesticide Residue Intake Model (PRIMo). That is, 3% of food items from conventional production that were sampled across Europe contained pesticide residues above the safe level. It’s up to you to decide whether that is a lot or only a small fraction. Assuming three meals per day, 3% means that you eat roughly 30 food items per year that contain unsafe levels of a pesticide. Eating organic foods means that this happens only 7 times a year. And roughly half of the time your conventional food contains measurable amounts of pesticides that are assessed as being safe given current toxicological knowledge. Safe under the assumption that you eat only one food item at a time and that you are not exposed to any other chemical from e.g. shampoo, other cosmetics, laundry agents, pharmaceuticals, food packaging, air pollution, etc. at the same time. Those percentages obviously look different in different areas of the world, often far worse. It should be pointed out that, at least to my knowledge, there are no studies that show that people consuming organic food are indeed healthier. But please comment if I have overlooked a study. Of course, such absence of proof might only demonstrate that no adequate studies have been performed yet. We simply don’t seem to know. My personal take on this: I eat organic as often as reasonably possible, but I don’t fret if I have to eat conventional food. It’s nice to live in Sweden, where organic food is in ample supply in basically every supermarket and grocery store. Regarding environmental impacts of pesticide use: oh, where do I begin? That’s perhaps something for another post. Sufficient to say that there is basically no pesticide-free lake or river left in industrialized countries or near centers of agricultural production worldwide. And regarding the (lack of) regulatory oversight, it might suffice for now to point the interested reader to a recent article in the Guardian, which discusses a Science paper by Milner & Boyd in Science (2017). Please note that Boyd is the chief scientific adviser to the UK’s Department of Environment, Food and Rural Affairs. Same here: the topic would definitely warrant a series of separate posts. There are humongous differences between countries, crops, production systems and workforces. As usual women and children in low-income countries are worst off. Comparing organic and conventional agriculture without considering the consequences of pesticide use misses the elephant in the room. And it’s a big elephant. 10. Nov. 2017: The values in the table above were initially listed as representing ADI’s. However, the given percentages relate to the fraction of food items analysed that contain concentrations above the corresponding MRLs. Thanks to George Nikolich for spotting the error and commenting (see below)! However, this does not affect the conclusions. Clark, M. and Tilman, D. (2017) ‘Comparative analysis of environmental impacts of agricultural production systems, agricultural input efficiency, and food choice’, Environmental Research Letters, 12(6), p. 64016. doi: 10.1088/1748-9326/aa6cd5. What about habitat impacts? Hydrological effects and soil runoff impacts on habitat quality! The environmental impacts of pesticide use is so widespread and diverse, I simply failed to even mention all of them. In your table comparing conventional with organic, for “Pesticide residues above ADI” you list values that I think are actually MRL exceedances. Furthermore, one cannot know if ADI has been exceeded unless they also know something about the consumer and the amount consumed. Is that not correct? Is that the source of the numbers in your table? If so, you may want to consider correcting your error and adjusting your interpretation of what is “safe” based on the information below. Those who may not be familiar with the difference should know that MRLs are residue limits expressed as a concentration like ppm, and are calculated based on ADI values determined from animal toxicology studies. ADI is usually expressed as mg/kg body weight per day. The point of all that is to say eating food with residue exceedances is not the same thing as saying one is being exposed to unsafe amounts of pesticide. Of course, passionate anti-pesticide people will claim that no amount of pesticide is safe to eat, but that is another matter. The EU seems to have a greater challenge with residue exceedances than we do in the US. Our most recent pesticide residue data (https://www.ams.usda.gov/datasets/pdp/pdpdata) indicate that exceedances occurred on only 0.35% of domestically-produced foods; half of what EFSA reported for EU organic. Those exceedances that do occur fall well below those which could be reasonably expected to produce exposures greater than either acute or chronic Population Adjusted Doses. My bad, you are absolutely correct. I have corrected the post accordingly. Thanks for pointing it out (honestly)! Concentrations below the MRL are safe (within the limitations that I describe in the post). So, how would one call a concentration exceeding a safe level, if not “unsafe”? Interesting that the US has lower exceedance rates. Might be interesting to compare the US vs. the EU estimates of maximum safe concentrations. Consider my pyrethrin example: Both US and EU have set MRL at 1 ppm. A 60-kg person would have to eat 42 100-gram apples in one day to reach the ARfD. If the residue found on apples exceeded the MRL and was 1.2 ppm, a 60-kg person would have to eat 35 100-gram apples in one day to reach the ARfD. Are the apples with 1.2 ppm pyrethrin residue unsafe? The acute reference dose (ARfD) accounts, as the name implies, only for acute toxicity. MRLs are supposed to protect against long-term exposure. Again, as argued previously, mixing up descriptors for acute and chronic toxicity (ARfD and MRLs) is largely pointless. The website that you link to is from 1997. Slightly outdated. Okay, so let’s use ADI (cPAD). Is it significantly more likely that a person will eat twenty 100-gram apples every day, day after day, for a long period of time rather than twenty-four? Just because a reference is a bit dated doesn’t make it wrong. The problem with the MRLs is that (as I explain the the post) some of them are driven by toxicological issues, some by analytical issues, some by GAP. It is therefore quite easy to cherry-pick values. Example? ADI for Chlorpyrifos in the EU is 0.001 mg/kg bodyweight and day. So, your 60kg person can tolerate 0.06 mg/day. MRL for oranges is (in Europe): 0.3 mg/kg. The “safe” amount of 0.06 mg thus equals a mere 200 g oranges that contain the MRL per day. Which is a quite realistic amount. So, concentrations even higher than the MRL are definitely something I’d call “unsafe” in this scenario. > Just because a reference is a bit dated doesn’t make it wrong. No, but a reference that is 20 years old is simply unreliable, especially when the topic of the discussion is the current (!) regulatory assessment of pesticides. If you can’t be bothered to check the current (!) state of play, then what’s the point of this conversation? “However, it should be stressed again that since the national control programmes are targeted sampling strategies, the identified cases of MRL exceedances should not be considered as being statistically representative of the food available to European consumers.” http://onlinelibrary.wiley.com/doi/10.2903/j.efsa.2017.4791/epdf, page 49, paragraph 3. Your claim that all foods with MRL exceedances are “unsafe” is also refuted in the same report, which describes the process of reporting an exceedance, conducting an individual risk assessment of that exceedance, and if the results of that risk assessment yields a value less than reference value (usually ARfD), the food is said to have a very low probability of risk to human health, i.e., it is safe. A clear majority, if not an overwhelming majority of samples with MRL exceedances are deemed safe by this process. Section 5 starting on page 79. As for your chlorpyriphos claim: It’s not a matter of cherry picking, it’s just an artifact of the system. The 2015 report cited above (published in 2017) states that approximately 1% MRL exceedances is expected to occur (Section 4.3, page 78, top of page) “even if the approved Good Agricultural Practices are fully respected.” Finding cases that stand out, as in the case of chlorpyriphos, is one of the goals of the whole annual pesticide residue reporting enterprise. “Among the approved pesticides, chlorpyrifos was the substance found most frequently in concentrations exceeding the legal limits…” That observation does nothing to refute my argument. A thorough understanding of EU reports on pesticide residues and Regulation (EC) No 396/2005 indicates that your conclusion is inconsistent with the facts and that your understanding of MRLs is flawed. Please correct your statements to reflect the fact that a clear majority of foods with MRL exceedances are indeed safe as determined by EUCP and national program risk assessments. “A comparison between organic and conventional agriculture” – what is, anyway, the difference between organic and conventional, since conventional is usually organic, and the other way around? That might be a question for somebody with a linguistic background. I’m just a German who tries to use the English language exactly the same way as everybody else. And commonly, as you well know, “organic” is a term that describes an approach to agriculture and animal farming that avoids conventional pesticides, veterinary drugs and mineral fertilizers as much as possible. Yes. I know that there are some pesticides and veterinary drugs that are accepted by some of the major organic farming organizations.